In the course of figuring out this blog’s and my social media presence around the internet, there is a lot of passing off of personal information between applications and services, whether I’ve realized it or not. Chances are, this is just as relevant to you. If you use Twitter, Facebook, Instagram, Foursquare, Flickr, Google+ or anything else that has asked permission to access your information elsewhere, it’s simply hard to keep track of what exactly you’ve allowed to do what with your personal information. Good thing there’s a tool out there that helps you do exactly that. And the best part is, it’s not yet another application. 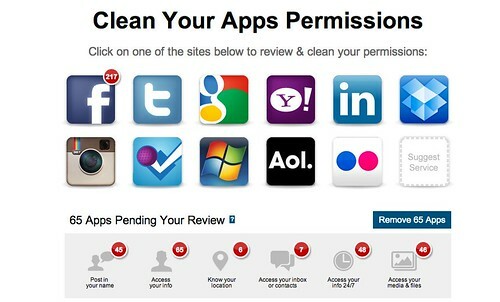 MyPermissions uses a website interface with an optional plug-in that you can install on your browser for easy access. And directly from inside the one-page interface, you can click directly to your account’s permissions page inside Twitter, Facebook, Instagram, etc. to see exactly what each social media tool is accessing. Before you tweet and instagram your next food photo, you best give it a try. You’d be surprised to see the different apps you’ve inadvertently allowed access to – especially your Facebook account. (Those sneaky guys.) From the same interface, you can edit these very permissions. Easy. This entry was posted in Tech and tagged @mypermissions, access, applications, apps, information, MyPermissions.com, passwords, permissions, personal, tech. Bookmark the permalink.